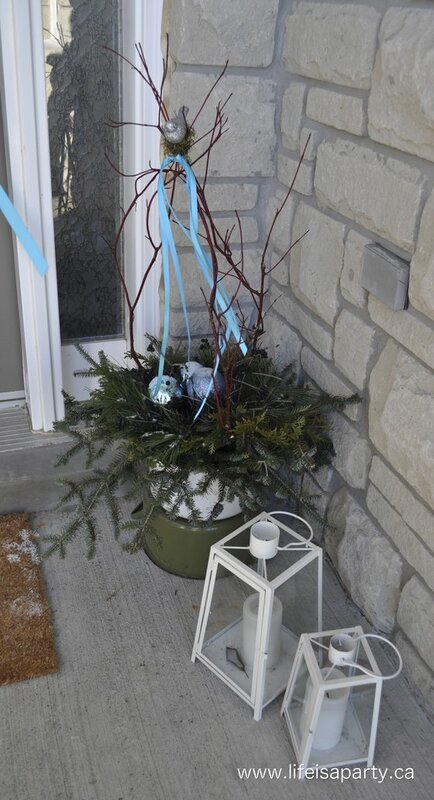 I’m excited to share my outdoor decorating with you today. As I’ve mentioned before, we’re going with a vintage theme for Christmas this year, and that idea even influenced my outdoor decorating. My awesome sister helped me, so it’s a little extra special this year. 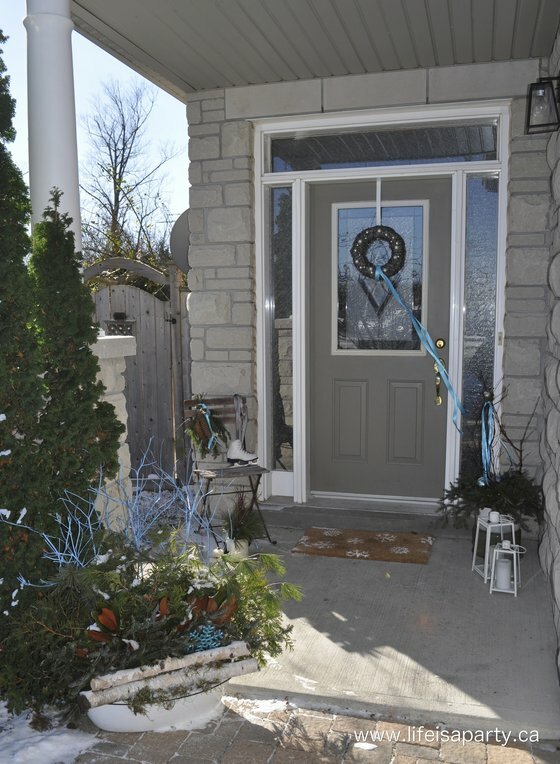 😉 Since we have blue snowflake Christmas lights, and turquoise is big in vintage decor, we did a turquoise colour scheme this year outside. It’s a little brighter than what we usually do around here, but vintage is all about colourful when it comes to Christmas so we went for it. 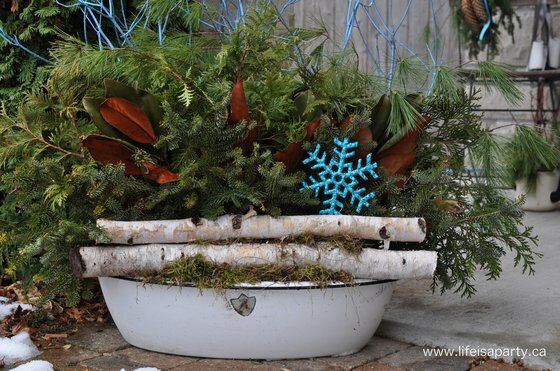 The big arrangement is in an old enamelware pot, actually probably an old baby’s tub. I so, so loved the linear arrangement that I did last year -see it here, that it influenced what we did this year too. 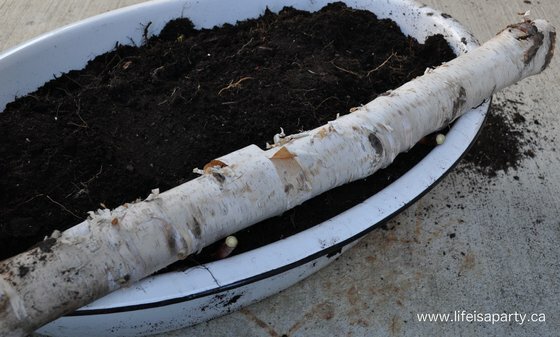 My sister arranged the two birch logs on the bottom, and used a few other twigs driven into the dirt to hold them. 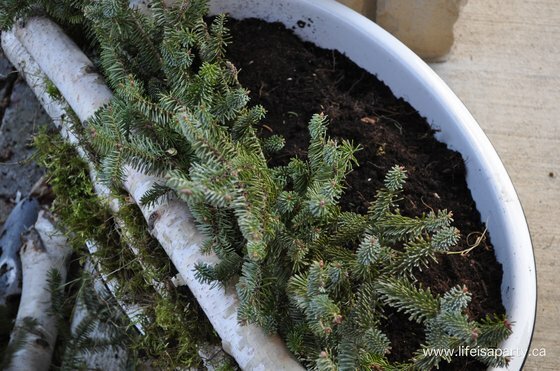 Then she stuffed a little moss in between to fill the gap. 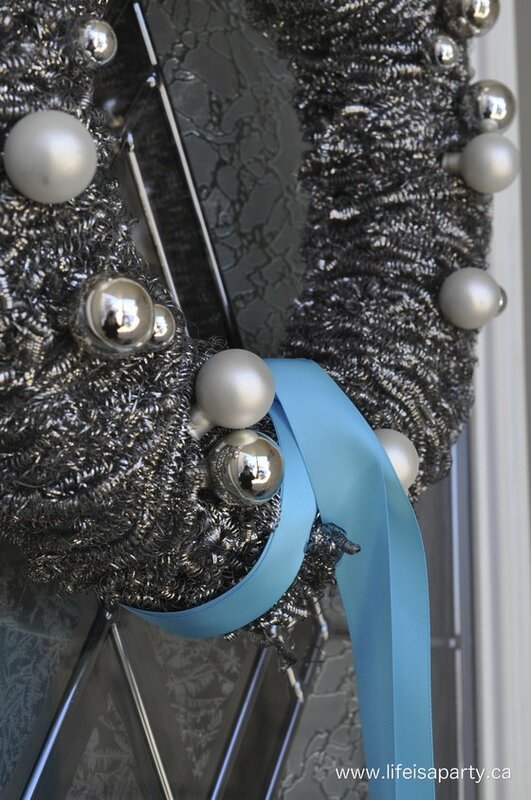 Such a pretty detail. I spray painted the branches in this arrangement for a little added wow. They would have been really pretty in white or silver too. The rest is just greens arranged in rows. 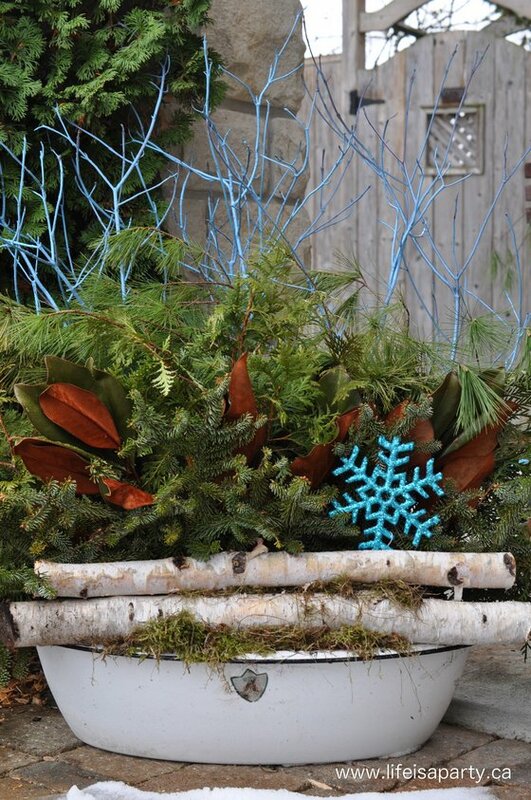 We started with the birch logs, then there is a row of fir, then magnolia leaves -picked up at Walmart for about $5, then a row of cedar, then pine, and lastly the dog wood painted turquoise. For a little glitter I added a big turquoise snowflake. 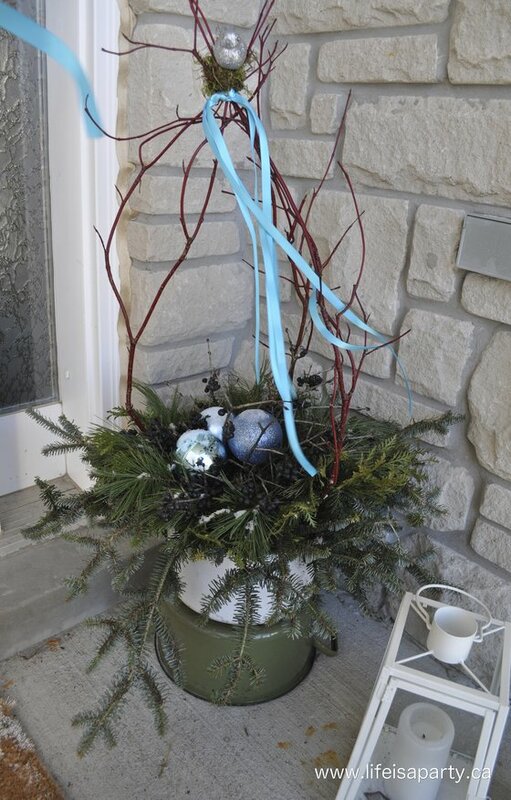 We also did another arrangement beside the front door, this one with a sweet little bird ornament. For it we used another enamelware pot, and then to give it a bit more height we set it on top of another pot turned upside down. 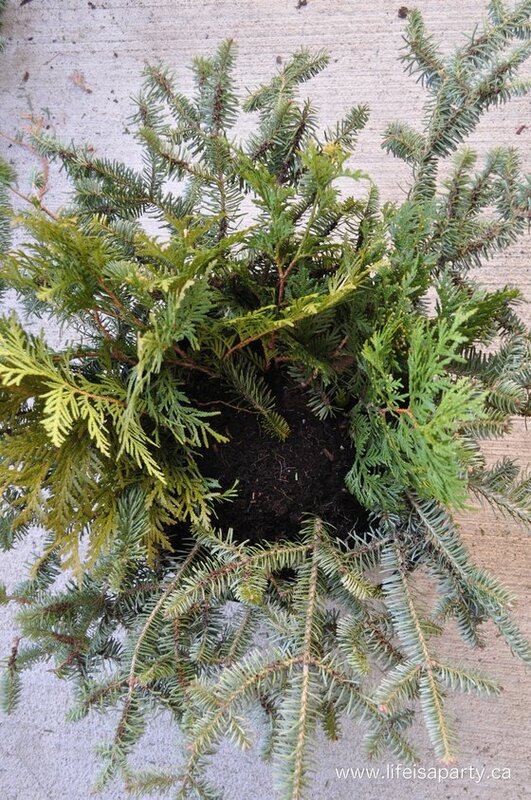 This one started out with circles of different greens, starting with fir, then cedar, then pine, and then finally the centre was filled with hawthorn berries. After the greens were finished, we added three long pieces of dogwood to the outside, stuck in almost horizontally, then pulled them up to tie them together in the middle and create a bird cage effect. I love how it turned out. 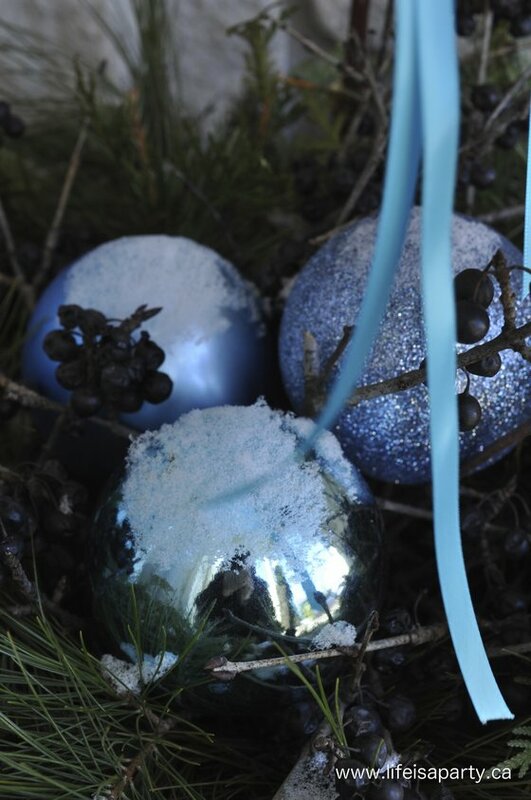 I added a few Christmas balls to the centre, which reminded me of magical eggs. 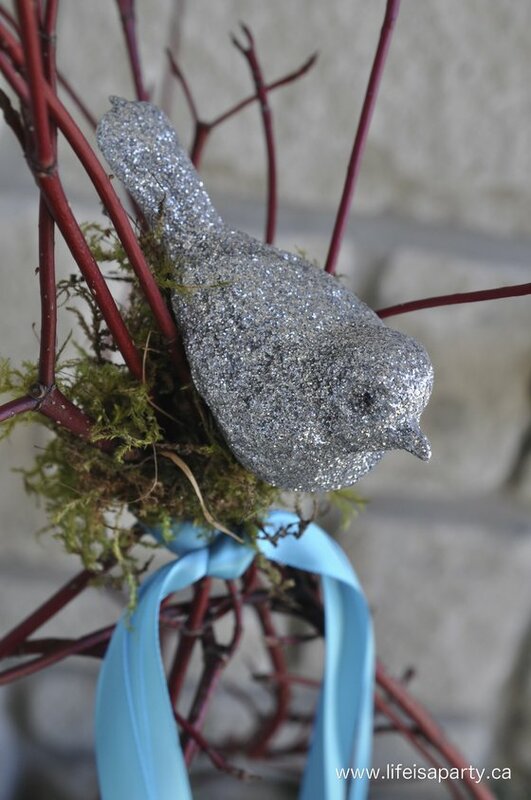 The final touch, was adding a little glitter bird ornament to the top. The twigs were wired together, and everything is beautifully finished by just a little moss to cover up the mechanics, and some pretty ribbon. 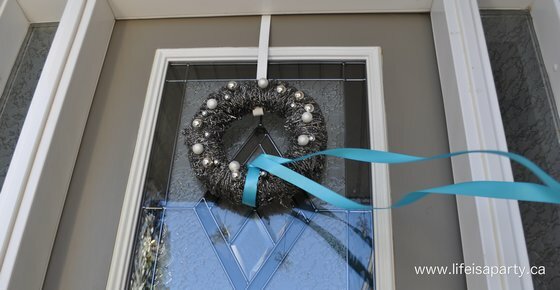 On the door this year, I used my pot scrubber wreath -see how I made it here, it’s constructed out of dollar store pot scrubbers! 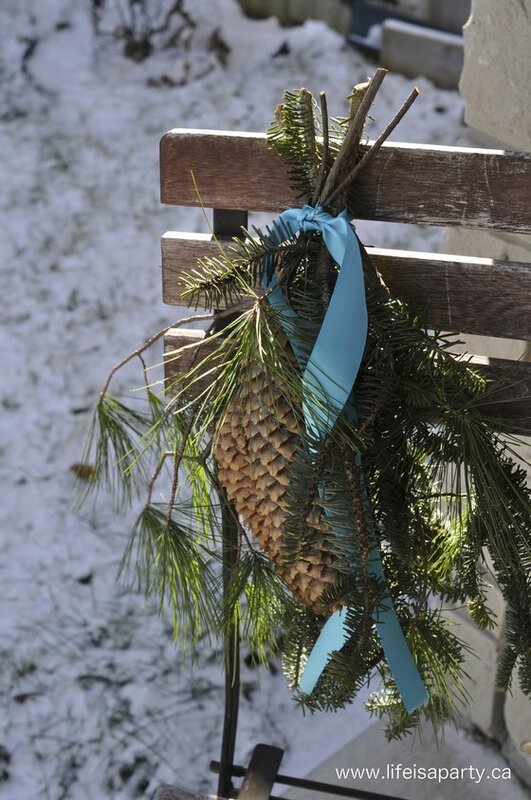 I love its vintage feel, and we tied it into this years scheme by added more pretty ribbon. The last spot we decorated was the little wooden chair. 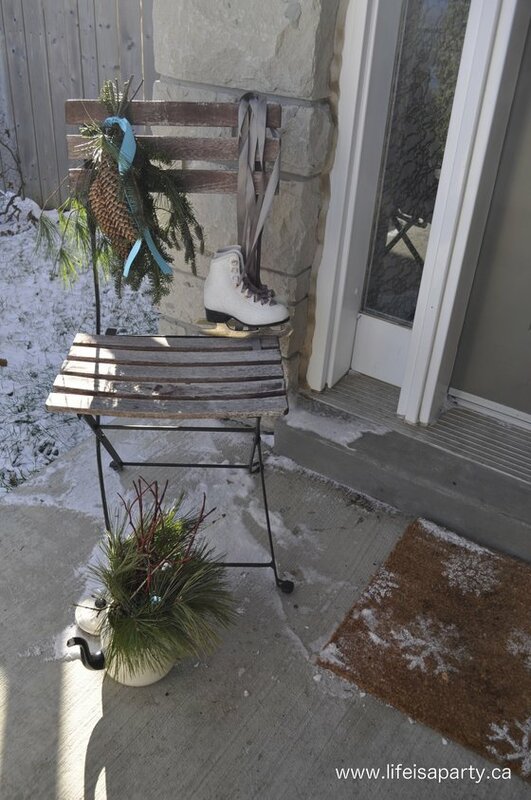 I dug out the glitter skates -see how I made them here, and we added a pretty little sprig of greens, with a few pinecones. 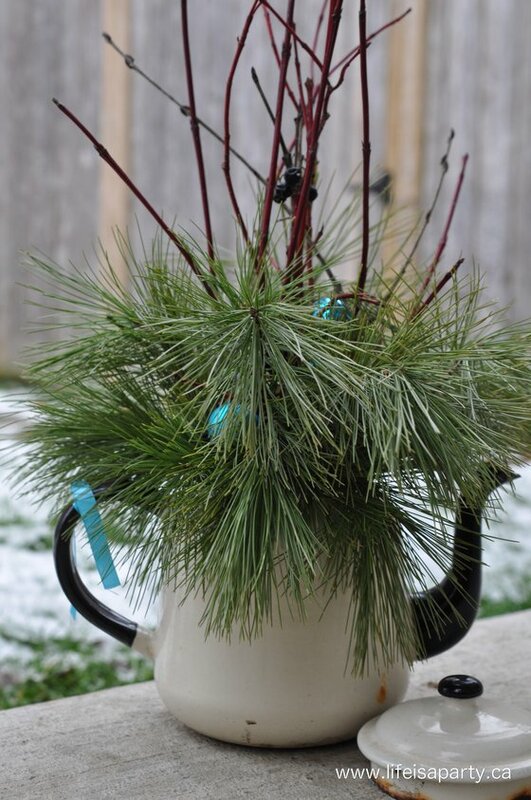 Last, but certainly not least, my sister made a simple arrangement in an old teapot. All the enamelware gets used in the summer on the deck as planters. 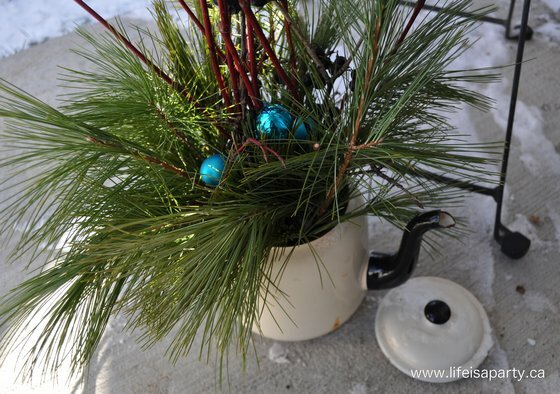 When we were pulling the pots out of the garage to use for Christmas, she noticed the little teapot. 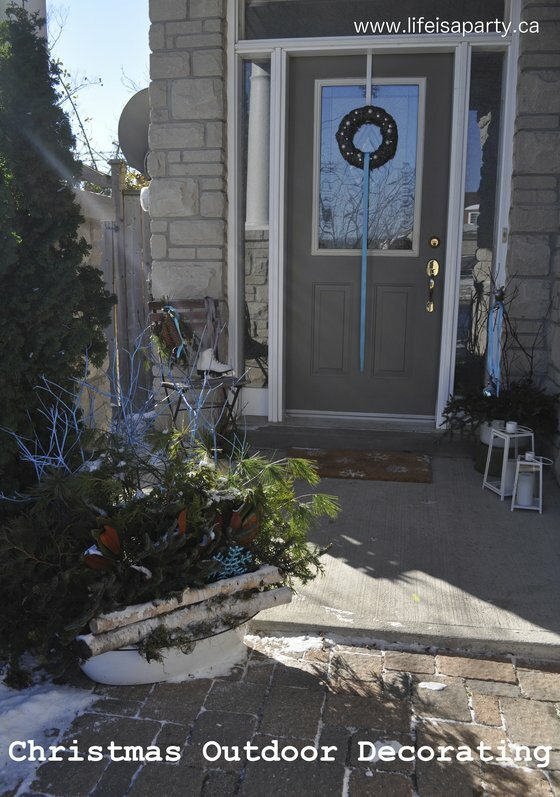 So the doorway is all decorated and ready to welcome friends and family all winter. The bright turquoise makes me smile. With a Christmas welcome, life really is a party! « One of a Kind Show 2013 -Vintage Inspired Treasures!